This concentrated, nonacid formulation is designed to clean, disinfect and deodorize hard inanimate surfaces in a restroom. Bactericidal, fungicidal and Virucidal, it is proven effective against a broad spectrum of pathogens. The powerful odor-killing ingredients in this product help to counteract malodors. Use with confidence, this nonabrasive disinfectant cleaner will not harm plumbing, slow septic tank action, etch porcelain or pit fixtures. 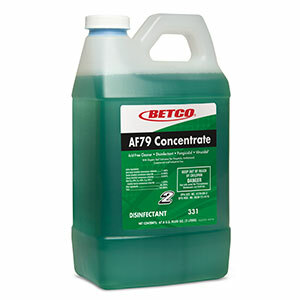 Non acid formula is safe for use on all hard, nonporous water washable surfaces. Non-Acid formulation is safe to use every day. DISINFECTION/VIRUCIDAL*/FUNGICIDAL/MOLD AND MILDEW CONTROL DIRECTIONS: Apply use-solution to hard, nonporous surfaces, thoroughly wetting surfaces with a cloth, mop, sponge, sprayer or by immersion. Treated surfaces must remain wet for 10 minutes. Wipe dry with a cloth, sponge or mop or allow to air dry. For heavily soiled areas, a preliminary cleaning is recommended. Prepare fresh solution daily or more often if the solution becomes visibly dirty or diluted. Rinse all surfaces that come in contact with food such as countertops, appliances, tables and stovetops with potable water before reuse. Do not use on utensils, glassware and dishes as a disinfectant. For sprayer applications, use a coarse spray device. Spray 6 - 8 inches from the surface, rub with a brush, sponge or cloth. Do not breathe spray. For fungicidal activity: At 1 oz. per gallon of water, this product is an effective fungicide against Trichophyton mentagrophytes (the athlete's foot fungus) when used on surfaces in areas such as locker rooms, dressing rooms, shower and bath areas and exercise facilities. 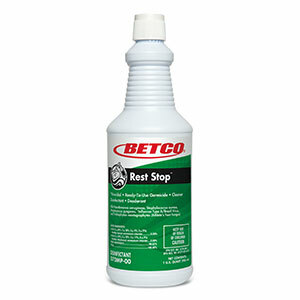 For mold and mildew control: At 1 oz. 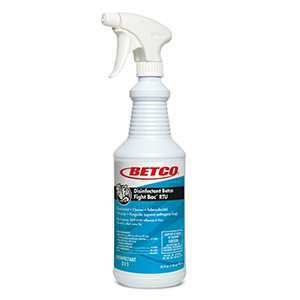 per gallon of water, this product will effectively inhibit the growth of mold and mildew and the odors caused by them when applied to hard, non-porous surfaces. Allow to dry on surface. Repeat every seven days or more often if new growth appears. This product is not for use on medical device surfaces. GLASS CLEANING/DEODORIZING DIRECTIONS: Add 1/2 - 2 oz. 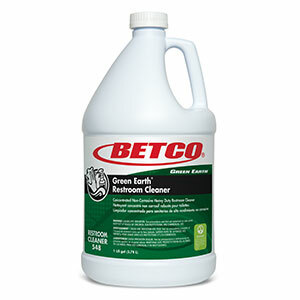 of this product per gallon of water to clean and deodorize windows, mirrors and glass surfaces. Use a coarse spray device. Spray 6 - 8 inches from surface. Rub with a sponge or cloth. Do not breathe spray. NON-ACID TOILET BOWL AND URINAL DISINFECTANT/CLEANER DIRECTIONS: If surfaces are visibly dirty, preclean first. From Concentrate: Add 1 – 2 oz. to the bowl water and mix. Thoroughly brush or swab over exposed surfaces including under the rim with a cloth, mop or sponge. Allow to stand for 10 minutes and flush. From Use Solution: Empty toilet bowl or urinal and apply a 1 – 2 oz. per gallon use-solution to exposed surfaces and under the rim with a cloth, mop, sponge or sprayer. Brush or swab thoroughly, allow to stand for 10 minutes and flush. *KILLS HIV AND HBV AND HCV ON PRE CLEANED ENVIRONMENTAL SURFACES/OBJECTS PREVIOUSLY SOILED WITH BLOOD/BODY FLUIDS in health care settings or other settings in which there is an expected likelihood of soiling of inanimate surfaces/objects with blood or body fluids, and in which the surfaces/objects likely to be soiled with blood or body fluids can be associated with the potential for transmission of Human Immunodeficiency Virus Type 1 (HIV-1) (associated with AIDS) or Hepatitis B Virus (HBV) or Hepatitis C Virus (HCV). SPECIAL INSTRUCTIONS FOR CLEANING AND DECONTAMINATION AGAINST HIV-1 OR HBV OR HCV ON SURFACES/OBJECTS SOILED WITH BLOOD/BODY FLUIDS. PERSONAL PROTECTION: Clean up must always be done wearing protective gloves, gowns, masks and eye protection. CLEANING PROCEDURE: Blood and other body fluids containing HIV-1 or HBV or HCV must be thoroughly cleaned from surfaces and objects before application of this product. CONTACT TIME: Leave surface wet for 10 minutes. DISPOSAL OF INFECTIOUS MATERIAL: Blood, body fluids, cleaning materials and clothing must be autoclaved and disposed of according to local regulations for infectious waste disposal.